◾Out with the old and in with the new. Before move day, take an inventory of everything the two of you have, and make a list of things you want to keep and what you can get rid of. Chances are you will have duplicates of some items, and taking inventory will prevent you from moving unwanted duplicates. In addition to avoiding duplicates, an inventory exercise prevents you from moving into a cluttered new home. ◾If you are packing your own stuff, organize and re-organize. Pack your boxes with similar items from the same room. If you have small hardware from furniture or decorative pieces, put them in zip lock bags and label them. Baggies keep the small, easy to lose items kept together in one place. Also, labeling and color coding your boxes will make the move much smoother. 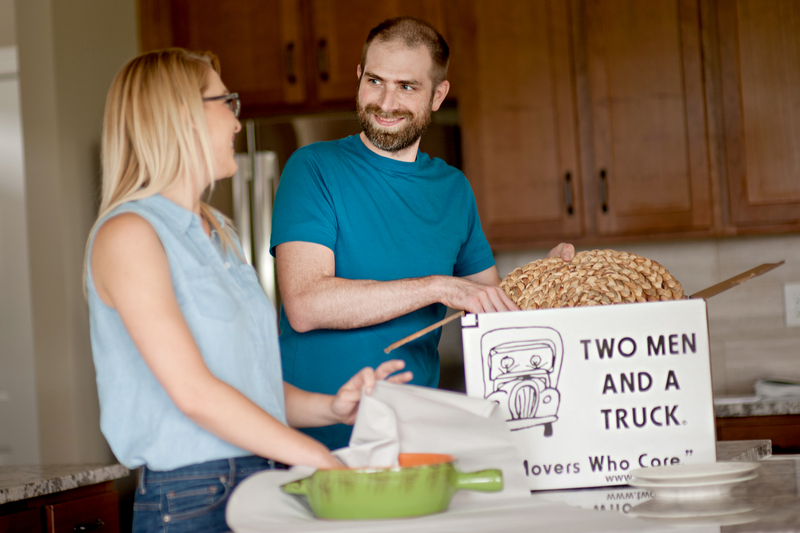 Moving as newlyweds is an exciting time, you don’t want to cause unneeded frustration with your spouse because you can’t find certain items. ◾If you are moving to a new area, consider renting before buying. By renting, you are not committing to anything right away, and it allows you and your spouse to get to know the area, ensuring you will like your new town before becoming a permanent resident. Keep in mind, if you’re moving from an apartment, or condensing into one apartment with your spouse, our move crews are familiar with apartment complex rules and regulations, such as parking arrangements and service elevators in high rise buildings. Let us do the heavy lifting up and down those pesky flights of stairs or through those narrow hallways. ◾If you are ordering household items, because no one bought you that Keurig or Pottery Barn duvet set you had on your registry, have these items shipped to your new home several days after you move in. This will avoid moving the items twice if they arrive before your move day and will save you from chaos if they are sent to your new home on the day of the move. ◾Have a decor in mind so you can get on top of your interior decorating right after you move in. However, don’t get too stuck on a design. Be open to ideas and be willing to work with your partner to make each room decorated with a blend of both styles. Remember, the key to a happy marriage is compromise! ◾Most importantly, leave the actual moving to the professionals. Hire a moving company. Not only will this save you the heartache of finding your new china piece dining set in a shattered mess because it wasn’t packed properly, but it will save you from a heated argument with your spouse over who packed that box. This is a busy period in your life, let us help make your move a fun transition in your new lives together. Look for companies seen frequently within your community. This will illustrate the company is a credible organization with a strong reputation. Wow Hannah. You did justice to this topic. Love, Marriage and then Moving into a new home. Beautifully explained. Your perspective on decor is refreshing. In my experience, making a fuss about decor always lead to bad decisions.